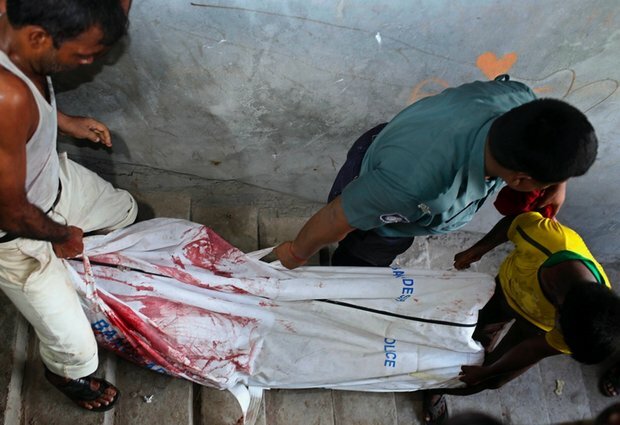 DHAKA, Bangladesh (AP) — Suspected militants posing as tenants entered an apartment building and hacked to death a secular blogger in Bangladesh's capital in the fourth such deadly attack this year, police said. Friends of Niloy Chottopadhay, 40, who also used an online name of Niloy Chowdhury, said he had received several threats recently, prompting him to remove all his photos from his blog. They said he was a secular blogger and had a Facebook account with the name "Niloy Neel" in which he criticized radical Islamists at home and abroad. Asha Moni, the victim's wife, said at least four young people attacked her husband Friday. She filed a murder case against four unnamed persons, police official Zahidur Rahman said Saturday, but no arrests have been made so far. Hours after the assault, Ansar-al-Islam, which intelligence officials believe is affiliated with al-Qaida on the Indian subcontinent, sent an email to media organizations claiming responsibility for the killing and calling the blogger an enemy of Allah. The authenticity of the email could not be independently confirmed. United Nations human rights officials called for Bangladeshi authorities to ensure accountability and prevent such violence. "The organized targeting of critical voices aims at promoting a culture of silence and fear," special rapporteur on freedom of expression, David Kaye, and extrajudicial executions, Christof Heyns, said in a statement in Geneva. The killing is the fourth of a secular blogger since February, when a Bangladeshi-American man who was also critical of Islam, Avijit Roy, was hacked to death on the Dhaka University campus while walking with his wife. Two others were attacked and killed in March and May, one in Dhaka and another in the northeastern city of Sylhet. Detectives say radical groups were behind the previous attacks and have made some arrests, but have failed to make any major headway into the killings. The family and friends said Chowdhury had sought police protection after he was threatened but police asked him to leave the country for his safety. Moni said her husband went to at least two police stations for recording a complaint in May after he was followed by two men on streets, but his complaint was not registered. Home Minister Asaduzzaman Khan Kamal denied the claim that Chowdhury went to police to seek security for him. Islam is Bangladesh's state religion, but the country is governed by secular laws based on British common law. Over the last decade or so, extreme interpretations of Islam have steadily gained ground.